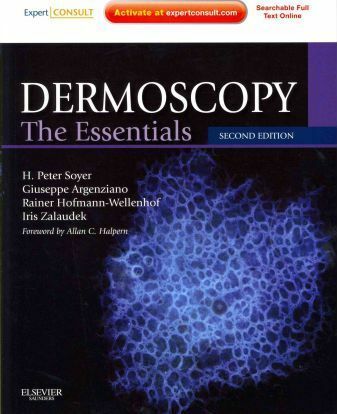 Dermoscopy: The Essentials presents the practical guidance you need to master this highly effective, cheaper, and less invasive alternative to biopsy. Drs. Peter Soyer, Giuseppe Argenziano, Rainer Hofmann-Wellenhof, and Iris Zalaudek explain all aspects of performing dermoscopy and interpreting results. With approximately 50% new clinical and dermoscopic images, valuable pearls and checklists, and access to the fully searchable text online at www.expertconsult.com, you'll have everything you need to diagnose earlier and more accurately. Avoid diagnostic pitfalls through pearls that explain how to accurately use dermoscopy and highlight common mistakes. Master all aspects of performing dermoscopy and interpreting the results with easy-to-use "traffic light" systems and checklists for quick and effective learning. Diagnose more accurately using the expanded section on testing tools for extra guidance on difficult cases. Gain a better visual understanding with approximately 50% new clinical and dermoscopic images that depict the appearance of benign and malignant lesions and feature arrows and labels to highlight important manifestations. 1. How to learn not to miss a melanoma using dermoscopy the three-point checklist. Dr. Argenziano's main research field is the clinical diagnosis of melanoma and, particularly, the development of more accurate methods for the early recognition of melanoma. He is author of numerous scientific articles concerning dermoscopy for the diagnosis of pigmented skin lesions and early recognition of melanoma. He is also author of 3 books on the subject (two published by Elsevier, one by Springer). Dr. Argenziano is Secretary of the International Dermoscopy Society and is the Congress Secretary of the First Congress of the International Dermoscopy Society in Naples in April 2006 (www.dermoscopy-ids.org/). His research on melanoma is very well regarded in the field. Because he is both a researcher and clinician, most of his research is very translational and has worldwide adoption. Dr. Argenziano is also among the top 20 researchers by publications in melanoma as indexed by SciVal.